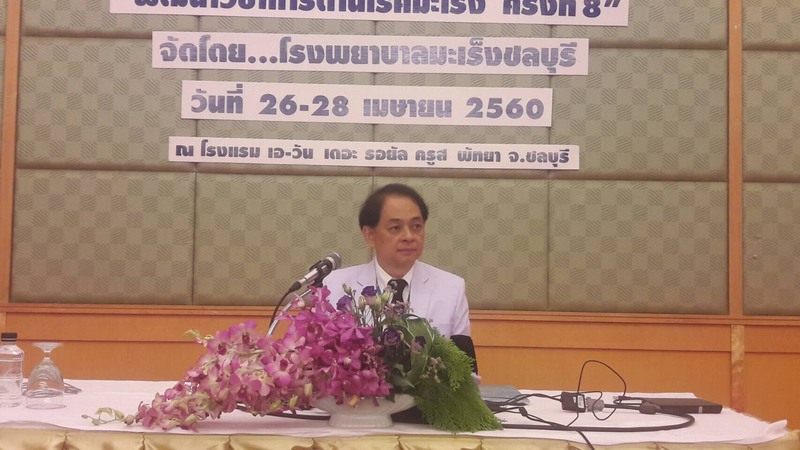 Thais’ love of somtam is leading to higher cancer rates and deaths, the head of the Chonburi Cancer Hospital told medical professionals in Pattaya. Dr. Sutat Duangdeeden was the lead speaker at the Chonburi Cancer Hospital’s 8th annual cancer seminar at the A-One Royal Cruise Hotel. Dr. Sutat Duangdeeden was the lead speaker at the center’s 8th annual cancer seminar at the A-One Royal Cruise Hotel. Sutat said rates of deaths caused by cancer in Thailand have increased in recent years with 60,000 cases now reported annually. Fatality rates also are increasing. While he noted that causes of cancer vary, Thais’ love of “pla ra” or raw fish used in somtam, as well as other undercooked foods are responsible for increased rates of worm infections, which can lead to liver cancer. Cervical cancer, he added, is now the deadliest disease for woman, even though most cases are preventable. Nearly all cervical cancer is due to human papillomavirus infections with two types, HPV16 and HPV18, accounting for 70 percent of cases. Between 60-90 percent of other cancers also are linked to HPV. Cervical cancer kills 5,000 Thai women a year and 10,000 new cases are reported. While a vaccine is available for HPV, the price remains too high for many Thais, Sutat said, adding that it should become more affordable in the near future. Pattaya City Hall recently announced that schoolgirls as young as fifth grade will be given free the series of shots needed over six months to prevent HPV.